Midas-touch investor Chamath Palihapitiya is launching a public company that will raise money through an IPO and then figure out what tech companies to buy. He’s trying to raise $US500 million to be spent on well-performing private tech startups. He’s enlisted other famous tech executives to help him run the fund, including former Skype CEO Tony Bates and former Twitter COO Adam Bain. 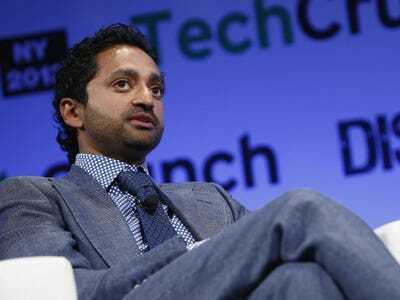 Chamath Palihapitiya, founder of VC firm Social Capital, is setting himself up to become the Warren Buffett of tech investing. To that end, he has launched a new “blank-check” company in partnership with London-based VC firm Hedosophia, aptly named Social Capital Hedosophia Holdings Corp.
Social Capital Hedosophia has filed paperwork for a $US500 million IPO although it makes no products, has no customers, and owns nothing … yet. It plans to raise the money first and then go out and buy stakes in private tech companies, ranging from minority stakes to controlling interests to full ownership. The idea is to give these tech companies the benefits of being a publicly traded company — like easier access to capital — with fewer drawbacks, like the “distraction” of doing the actual IPO and the bother of the quarterly, short-term view of investors, Social Capital Hedosophia explained in the documents it filed with the SEC. This tactic also gives public investors access to the wealth being created by well-performing private tech companies. Right now most of that wealth is going to a small pool of investors, mainly the VCs and private equity firms that get invited to the investment table. As of May 2017, Social Capital Hedosophia estimates there are about 150 tech startups valued at over $US1 billion, compared to about 200 public technology companies with a market cap of $US1 billion. In years past, those 150 companies would have become public companies. Today, they can hold out as private companies indefinitely because there’s so much money available to fund their growth from private investors. Such “blank-check” public companies, which raise money first and then figure out how to invest it, are currently in vogue, reports The Wall Street Journal’s Maureen Farrell. 22 such funds hve been launched on US exchanges so far this year, raising $US6.9 billion, according to Dealogic, Farrell reports. That’s not to say that one by Palihapitiya will succeed in either raising enough money in its IPO or in picking tech companies that will make its investors wealthy. But it is being backed by a who’s who in the Valley circles. Social Capital partner Tony Bates, best known as the former CEO of Skype, will be on the holding company’s board. Adam Bain is also joining the board. Bain is the well-liked former COO of Twitter who has been relishing in time off from a full-time job since he left Twitter in November. Bain has been advising startups and doing some other investments and board work, such as joining the board of sneaker company Goat last summer. There’s been a lot of speculation as to which company will finally talk Bain out of his retirement and back into an exec role. But Palihapitiya will be CEO of Social Capital Hedosophia. He’s well known as one of the original executives of Facebook and an owner/board member of the Golden State Warriors. As an investor, he’s backed companies like Box, Palantir, Pure Storage, Slack and Yammer.